On March 27, 2019 the Moderate Resolution Imaging Spectroradiometer or MODIS instrument aboard NASA's Aqua satellite provided a visible image of Joaninha. Joaninha maintained its eye, and the eye was surrounded by powerful thunderstorms. Bands of thunderstorms spiraled into the center of circulation from the east. At 11 a.m. EDT (1500 UTC) Tropical Cyclone Joaninha's maximum sustained winds were near 110 knots (126 mph/204 kph). It was centered near 20.5 degrees south latitude and 67.0 degrees east longitude. That's approximately 199 nautical miles (229 miles/369 km) east of Port Mathurin, Mauritius. Joaninha was moving to the east and is forecast to turn in a more southerly direction and begin weakening. The Mauritius Meteorological Services (MMS) noted that there is still an active warning for Rodrigues. A High Wave warning remains in effect for Rodrigues until 10 a.m. local time on Friday, March 29. 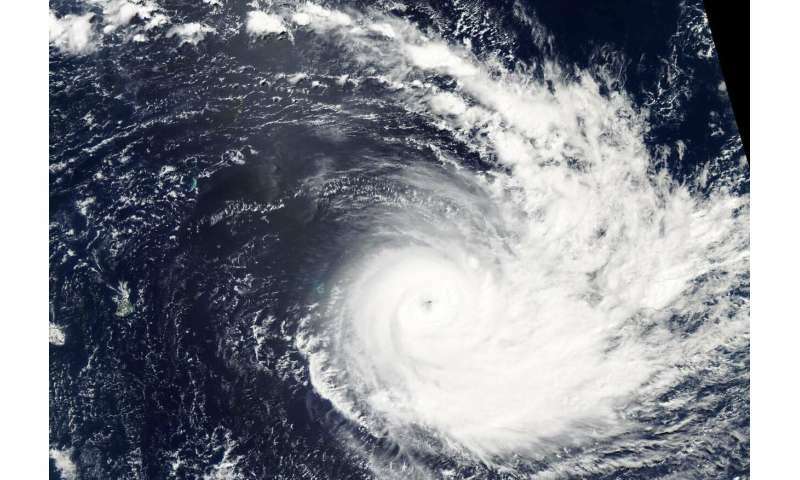 MMS's warning noted "The intense Tropical Cyclone Joaninha is generating heavy swells of the order of 5 meters [16 feet] which are influencing the sea state around Rodrigues. Also storm surge will cause a rise in the sea water level of about 1.0 meters [3.2 feet] above the normal tides which will result in the inundation of low lying coastal areas particularly to the east, south and south-west." MMS strongly advised for fishermen, boaters and the public not to go out at sea and not to venture on the beaches until they are given the "all clear" from local authorities.